Salem Baptist Church began in the hearts of 53 people on November 22, 1981, when they met in the home of one of the members. Because of the need for additional space, they began meeting in the Kitty Kasuals children’s shop in Bry-Man’s Plaza. On December 5, 1981, a meeting was held in the Fellowship Hall of Antioch Baptist Church. Dr. Raymond Brown attended that meeting to give guidance in the organization of the church. With great faith, prayer and determination, the group adopted a plan to start a new church. The next day, December 6, Dr. Brown preached in the morning and evening services. Following the evening service, Dr. Brown was called to be the first Pastor. On December 9, 1981, the church moved into the former Pleasant Grove Superette building located on Cleveland Highway directly across from Pleasant Grove Elementary School, and it was quickly turned into a place of worship. On January 10, 1982, Salem became a chartered church with 58 charter members. These are the individuals that had the vision and direction of God to begin the work that is now Salem Baptist Church. The sacrificial contributions and hard work of the charter members will forever be remembered and appreciated. On April 4, 1982, the church voted to accept the donation of a plot of land from Mr. & Mrs. Albert Dunn and Mr. & Mrs. Steed Dunn on which to build a church. On May 16, 1982, with only $4,683.43, the church voted to begin building. The groundbreaking for the new church building was on Saturday, June 19, 1982, and construction was begun. At this time, the church had not been named. Salem (meaning “peace”) was selected after being submitted by Reverend Hollis Pinson, Director of Missions of the North Georgia Baptist Association. During this same time, Salem was accepted into the North Georgia Baptist Association. On October 3, 1982, the first building (now known as The Brown Building, so named in honor of Dr. Raymond Brown) had reached a point of occupancy, and the first services were held on that date. Salem continued to grow and in June 1985 called a full-time pastor from Lincolnton, North Carolina, Reverend Randy Parker, who pastored at Salem for the next 8 years. Following Brother Parker, Reverend Mark Randolph was called to pastor the church in 1993. Salem has ordained and sent out several preachers, with their families, who are presently in the pastorate. One of those men, ordained at Salem in 1982, was Pastor Darey Kittle. Brother Darey spent 13 years in the pastorate in other churches before returning to Salem as Pastor in August 1995. Since that time, Salem has grown tremendously and additional buildings have been added three more times. Since the initial worship building was built in 1982, more land was donated to Salem and in April 1996, construction began on a fellowship and education building. The fellowship/education building included more classrooms, larger administrative offices and a larger fellowship hall with kitchen. In the fall of 2004, the members of Salem voted to build a larger 700-seat worship center. The new worship center was completed in the summer of 2006 and is the current worship center today, hosting three Sunday morning worship services, as well as the Sunday and Wednesday evening services. At about the same time that construction began on the new worship center, the church acquired additional adjoining property, bringing the total area occupied by Salem to approximately 18 acres. In 2006, Pastor Adriel Lovera joined the staff as the full-time Pastor to minister to the Hispanic community. God is blessing Brother Adriel’s ministry and his congregation is now averaging 100 in the Sunday morning worship service. The Hispanic congregation also has three additional services and many other activities. In March 2013, our Hispanic congregation, Iglesia Bautista Hispana Salem, relocated to the former Dalton Baptist Tabernacle building at 113 N Grimes Street in Dalton. God is continuing to bless that work there. In the summer of 2008, the church was outgrowing the available space, and the church voted to build the most recent expansion, the Family Ministry Center, a multipurpose building with preschool, children’s and youth space, along with an even larger fellowship area and a gymnasium. This facility was completed and dedicated in January 2011. Today, the Family Ministry Center hosts two Sunday morning worship services called “The Venue” which includes a praise band and a video feed of Pastor Darey’s message from the main auditorium. 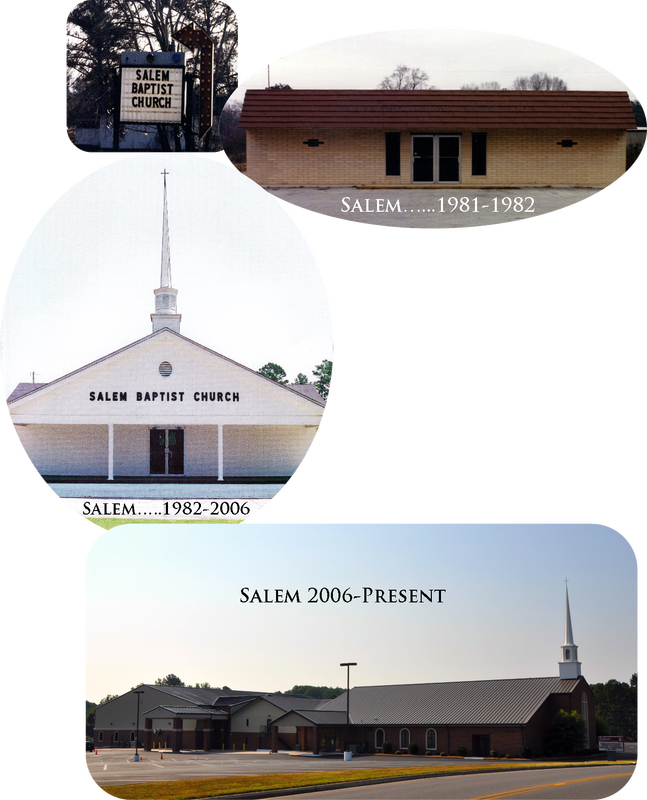 Salem has always been a church with a vision for the future and God has always miraculously provided. God has blessed Salem spiritually, numerically and financially throughout its existence. Since its organization in 1981, Salem has recorded over 730 baptisms and has grown in membership from 58 to over 1800 with many more non-members enrolled in Sunday school and other activities. Tithes and offerings over this period have exceeded $19 million. TO GOD BE THE GLORY! Salem is known for its strong support and participation in missions – locally, nationally and internationally. Salem is considered a world-wide mission center that reaches out to the community, state and to the ends of the world. The Great Commission was given to all believers and the church; to teach, baptize and share the Gospel with all people (Matthew 28:19-20). Salem is attempting to fulfill this commission through its many mission ministries. that I might live like thee! Praying, giving and serving allow each individual to make the Great Commission a reality in their life as well as the life of others.